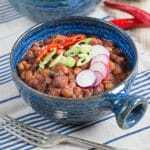 A hearty vegan chilli is the perfect winter dish to feed a crowd. Healthy, rich, flavourful and filling with a gentle heat and earthy notes from the cumin. Cook in a casserole in the oven or in the slow cooker. Vegetarian, Vegan, Gluten Free. Hearty winter food that is perfect for a mid week after work supper. Grind the cumin, coriander seeds and chillis. Add the ground spices to a pan and dry fry until aromatic. Remove and set to one side. Fry the onion, celery and garlic in the sunflower oil until starting to turn golden brown. Whilst the onions are cooking, drain and rinse the tinned beans. Reserve half the black beans together with their liquid and blitz with a stick blender to a smooth liquid. Add all the ingredients to the slow cooker pot. Cook for 4 hours on high, or 8 on low. Adjust for your slow cooker. Serve with baked potatoes or rice topped with any of grated cheese, guacamole, salsa and sour cream (vegan if required). Adjust the spicing and heat to suit your taste. This chilli is quite earthy form the cumin, use less if you prefer. Timings will vary depending on the brand of beans you use - the texture varies widely and your slow cooker. Adjust timings accordingly. Nutrition is for just the 5 bean chilli without toppings. This recipe without the toppings is 8 Weight Watchers Smart Points per portion.